Coffee cart hire company since 2005. Now also serving NZ. Offering a coffee cart with a barista at your event could not be easier with our mobile coffee cart system. They can be used just about anywhere and set up in no time. the country, Sydney, Melbourne, Adelaide, Hobart, Darwin, Perth, Brisbane, Gold Coast, Cairns. Our professionalism and expertise are reflected in our repeat bookings and growth of our business. From 90 people to 900 and beyond we are able to provide effective coffee catering solutions for your next corporate event. We exclusively supply our services to the corporate events market. Our service and equipment are geared for those who want their corporate event done right. Our coffee carts are ready for your next corporate event, adding espresso coffee and other hot drinks to your event could not be easier. We like nothing better than showing off our coffee machines on some of Australia's finest custom built trade stands. High end events are just what we are set up for. The Cafe in a Box systems are built for high volume conferences where serving delegates quality coffee while maintaining pace is key to your conference. 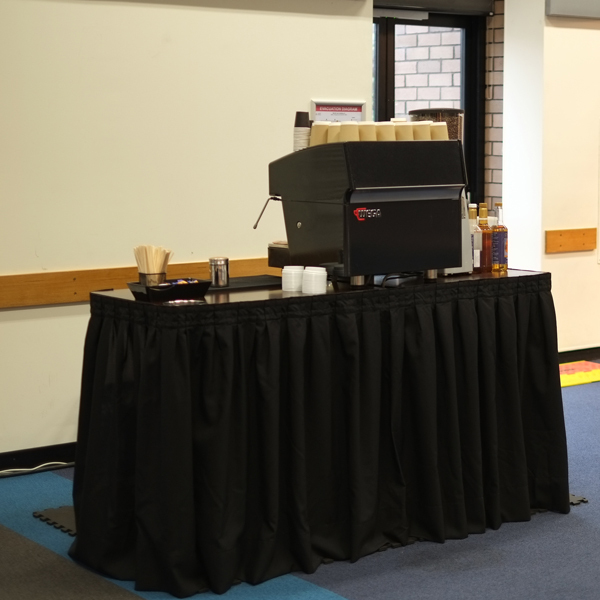 All our baristas are highly skilled in delivering cafe quality coffee in corporate event environments, all with the help of our unique coffee cart system. 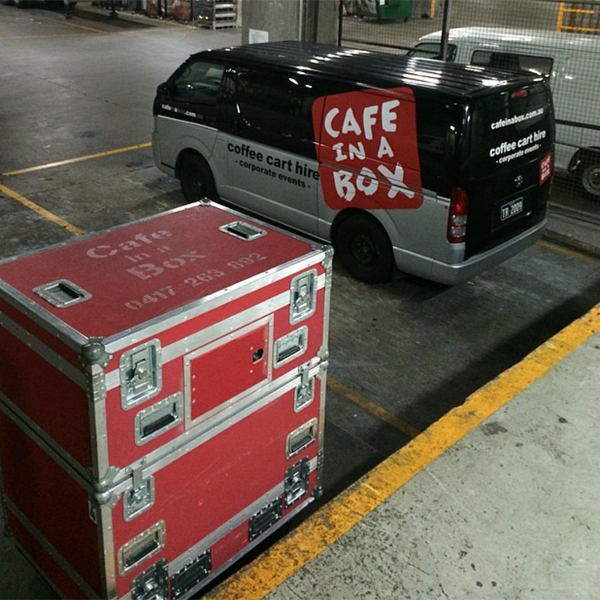 Cafe in a Box arrives in road cases which are rolled out of our shiny Toyota Hiace vans. Placed in just the right spot to catch all your delegates attention. The road cases then become the coffee cart wrapped in your choice of coloured curtains. This all takes between 45 minutes to an hour, then we are set to deliver your amazing coffee. Café in a Box was born in 2005 when owner, Michael Wilcock realised there was a need for corporate coffee catering. Since then, Café in a Box has emerged as one of the most popular mobile coffee cart suppliers to the corporate market. Michael spent most of the 90s living in Japan, where he worked in the hospitality industry and perfected his skiing ability. It was during this overseas stint that Michael developed his passion for customer service, returning in 1999 to open Groove Aroma. From 1999 to 2007, Michael owned and operated the company, selling coffee from its vans to businesses in Sydney’s Mascot and Botany industral areas. During this time, Michael bought a coffee roaster to roast his own coffee beans. To this day, only uses his special blend of roasted beans in his coffee cart, offering a quality and assurance of service you would expect from larger companies. Whether you’re holding a trade show, staff event or conference, you can expect a fully functional ‘café in a box’, together with Michael’s expertise and experience. Custom printed coffee cups, yes we can !